I am biased for loving this pizza, probably because I grew up in Decatur, IL where Monical's pizza is everywhere. 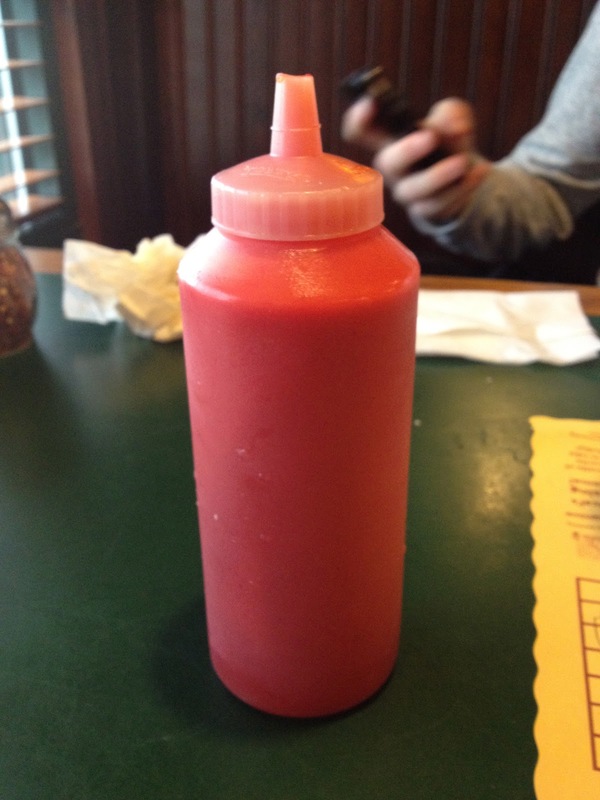 Anyway, they do have delicious pizza that is made even better with the neon red French Dressing! Everyone always questions me or judge me until they try it for themselves. I have brought a couple of friends here and now they crave Monical's and that amazing french dressing. Unfortunately, the rating is lower because of the distance from Chicago and because sometimes the crust is burnt more than I like it. But if you are out in the burbs, try this place! A creative play on the classic cinnamon roll. 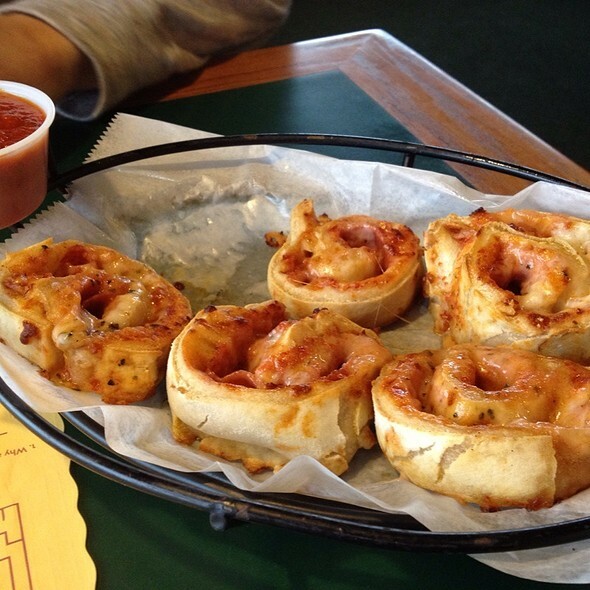 These pepperollies are freshly baked rolls stuffed with pepperoni, four cheeses, and brushed with a garlic butter. They are served with a side of their pizza marinara sauce and come in either 4 or 6 pieces I believe. I absolutely love this appetizer. In fact, I sometimes order 6 of them for my meal. The garlic butter makes the roll taste like garlic bread and they put so many pepperonis that they actually fall out when you bite into the roll. Definitely a must try! Where to start... I love this pizza! I always order the deluxe pizza. It is topped with sausage, pepperoni, mushrooms, onions, green olives, green peppers, and hot peppers. The hot peppers are KEY! They give the entire pizza a nice spice without adding loads of red crushed pepper. 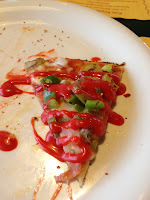 And rather than adding the red crushed pepper, I really enjoy covering my pizza with their homemade french dressing. The crust is extremely thin and has a crunchy texture to it... It almost reminds me of pizza from Naples... but of course an American twist on it. It is worth the drive! This french dressing is good on everything... from their salads to pizza. I started eating Monical's pizza with a couple of drops of french dressing and have slowly progressed to a slight drizzle to a dip and now I cover the entire pizza slice and also dip my pizza into this dressing. It has a tangy-sweetness to it, which compliments the spicy, savory pizza very well. 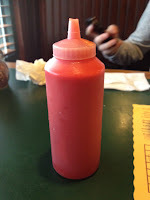 The color is interesting and at first you may be reluctant to try this combination, but I guarantee once you try it... you will also crave their french dressing on all pizza you eat. - You have to ask for FRENCH DRESSING!!! and COVER YOUR PIZZA IN IT!!! - Do get the pizzas with more toppings. I have found that Monical's is much better with more toppings. - The Family Pleaser Combo is a great way to share salad, pizza, and a pitcher of soda between a family! - Don't hesitate with the french dressing... yes I may be repetitive but it is THAT GOOD! The pizza's okay, but those pepperollies look like something to try out. I guess it's time to see if my private chef bristol's skills are up to the task.